March was a baking bonanza which meant a lot of cake needing eating. It was a tough job but we worked as a team and seemed to manage. We welcome all types of fundraising at the THHN – the tastier the better! So who saw the amazing pictures of our fun Bake Nominate challenge? There were some fantastic and delicious-looking creations made. Thank you so much to everyone who took part. To name just some of the cakes involved we have Lemon Drizzle, Victoria Sponge, Summer Fruit Pavlova, Swiss Roll, Blue Macaroons, the THHN Bear, the Emily Special, Rainbow Delight, Cinderella’s Carriage, and the THHN Collection. Please note these may not be their official names but if you saw them, you’d know who we meant. If you haven’t seen the photos then take a look on the Bake Nominate album we created on our Facebook page. Warning: looking at these images will make you want cake! We’re delighted to announce that the prize for the best-looking bake goes to Gavin Burns for his wonderful chocolate teddy bear cake. Gavin will receive a cream tea voucher for 2 people at Angels Tea Rooms in Babbacombe. Well done Gavin and a huge thank you once again for all who took part THHN’s #BakeNominate will be back next March, bigger and better! Last year, local spinning instructor Mark Mallen did a 12-hour spinning marathon to raise money for us and this year he and his friend, Chris Halls, are going to cycle from our gorgeous English Riviera all the way to Nice on the French Riviera – what a great idea. 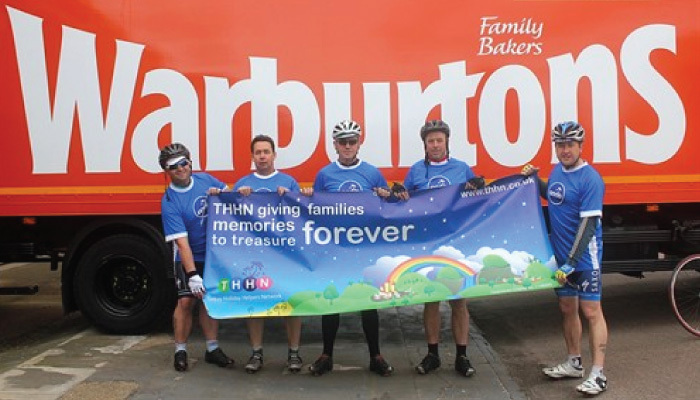 They set off on 18 May and plan to cycle the 770 miles in just a week. They’ll be setting up a Just Giving page soon so more information will follow about that but in the meantime, they’re very busy getting in as much training as possible on the English Riviera. Great work guys, thank you. Training for Luke’s latest challenge, running 100 miles along the Thames path, is going well. The trail race, starting in London and finishing in Oxford, takes place on 3 May. The race sees Luke competing agianst 350 competitors from 16 nations from across the world. As most of you know, Luke doesn’t just expect other people to fundraise for the THHN, he’s always up to something to help raise funds himself. If you would be interested in sponsoring him please go to http://www.justgiving.com/Luke-Tillen1 and remember, every penny counts. Thank you. /p> Last month we told you about the great Torquay Legends Football Match taking place at Plainmoor Football Ground on Saturday 10 May. Well, since then the line-up of Torquay Legends has grown and now includes Kenny Veysey, Tom Kelly, Sean Joyce, Kevin Hill, Mark Loram, Wayne Carlisle, Chris Hargreaves, Lee Hodges, Dean Edwards, Andy McFarlane, Robbie Herrera, Gareth Law, Ian Bastow and Russell Musker. Don’t forget, tickets for the match are just £3 each and are on sale at the Sportsman’s Arms pub on Laburnum Street, the Bombay Express on Belgrave Road, Torre Trophies and Alberts Bar on Belgrave Road. Torbay Crematorium who presented us with a cheque for £1918.11 after making us their chosen charity for 2013. Hotel De La Mer who this month welcomed two families referred by the Rainbow Trust Children’s Charity. The Babbacombe Ukulele Strummers who made us their chosen charity for 2013 and raised £203.77. This is the place to buy some great quality bits and pieces at fantastic prices. People kindly donate all sorts of things to help us raise money. Some of it brand new, some of it pre-loved and we decided to set up a sales page. It couldn’t be easier. “Like” the page to ensure you see each new item as it’s offered and let us know if you’d like to buy it. We’ve had a great response already and hopefully this will be another fundraising area that will grow and grow.